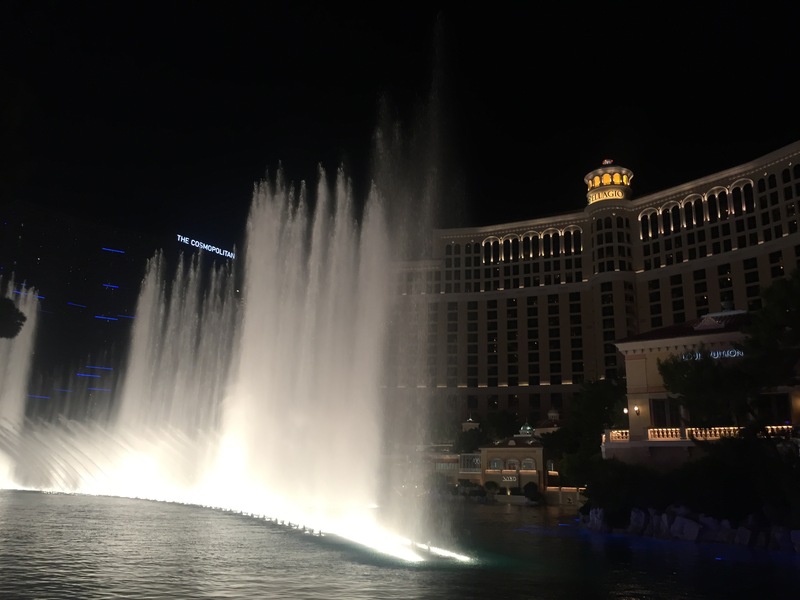 After the second wedding in Portland, we hopped a cheap flight to Vegas and spent a mostly uneventful night there minus a confrontation with a homeless, mentally ill woman who threw water on me. (Yes, thankfully, it was just water.) As it turns out the city shuts down around 10pm on a Monday unless you’re going to a club, want a New Orleans style drink (think, Hurricane) on the street or are gambling. So don’t plan a trip to Sin City during the week expecting it to be like the movies. But since this was only a layover until we could drive to Utah, it wasn’t a great loss for us. 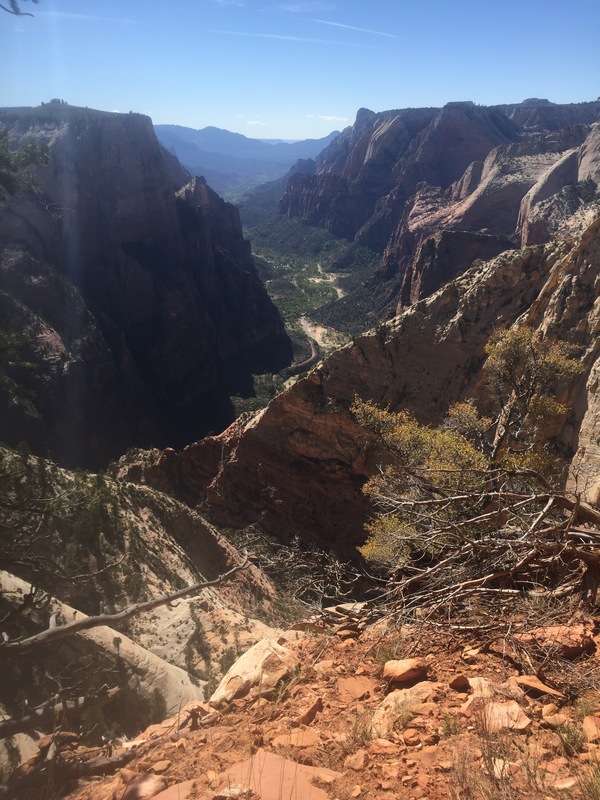 Continuing on with our year of U.S. travel, Zion National Park was our destination. The drive there was scenic, with small bushes and desert palms along the road. The best evidence of global warming is a desert with new growth and, unfortunately, rain in the forecast. But when we arrived, it was sunny and in the 80s. 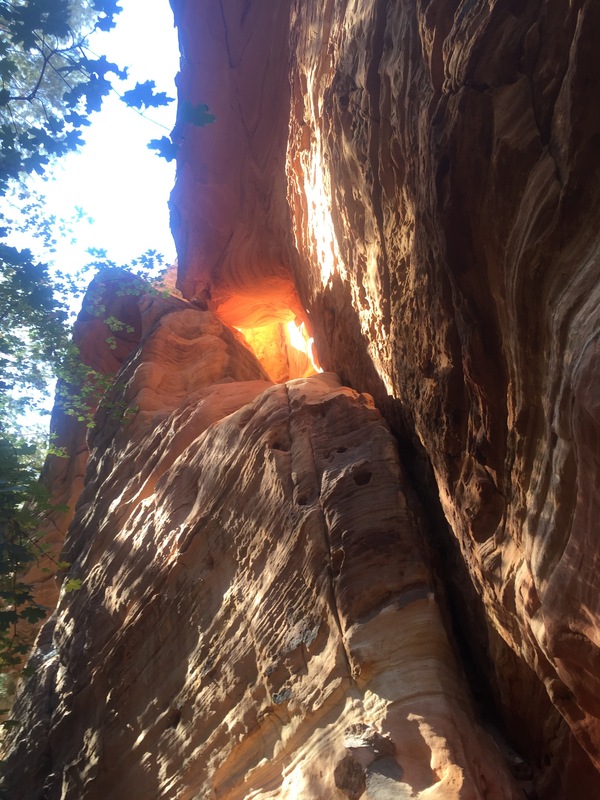 The sun looked like fire coming through the rock. 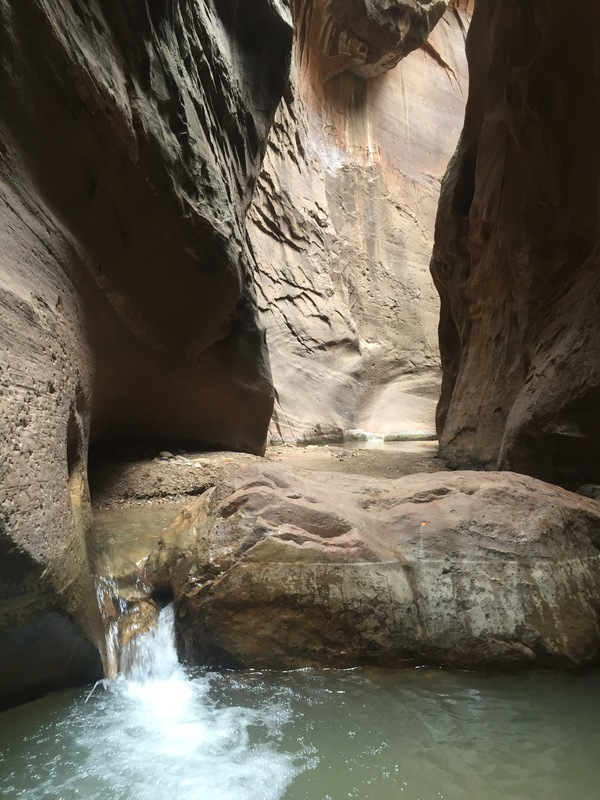 Instead, we hiked the Hidden Canyon trail and then up to Observation Point, stopping at Weeping Rock on our way down before hitting the Emerald Pools and Grotto Trail. It was a lot to do in one day, but we wanted to make sure we could see as much as possible. 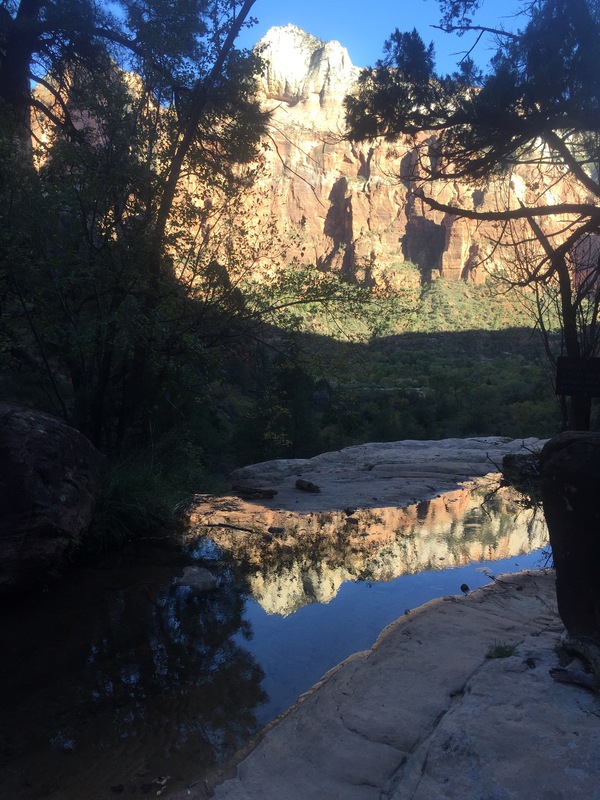 We were lucky to have such good weather in Zion. The next day it rained, which meant a possibility of flash flooding and less than ideal hiking conditions where a slip could mean death. 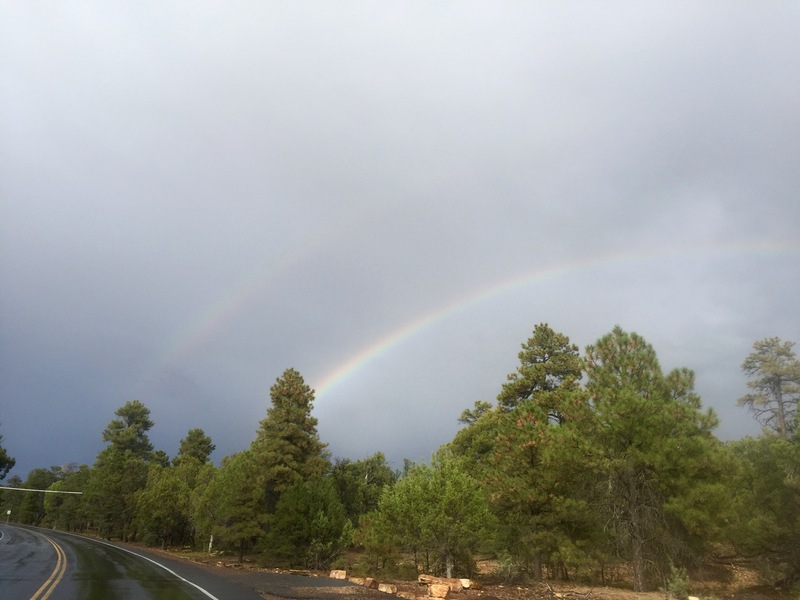 But the bad weather held off for our 3 hour but gorgeous drive to Flagstaff. 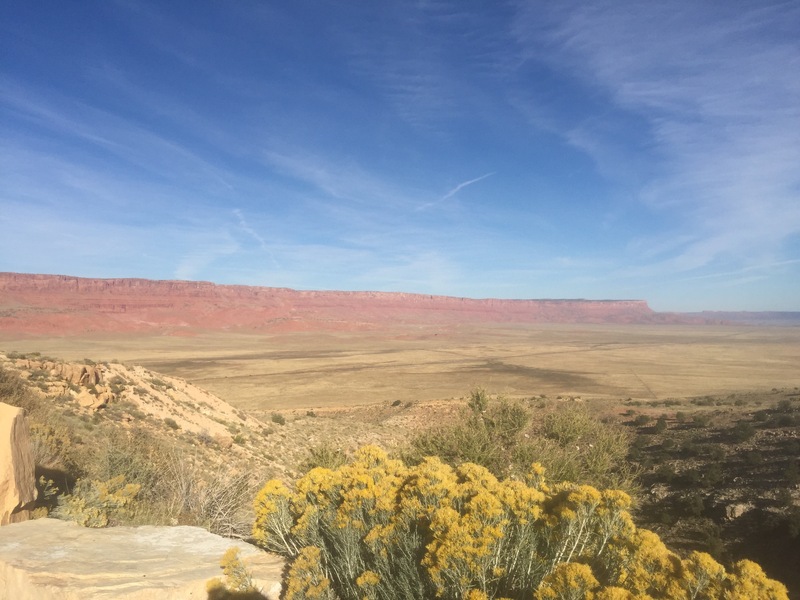 We planned to stay there only because we wanted to rent a Harley from Eagle Riders and drive to and from the Grand Canyon. The rain threatened to ruin our plans, but we decided to make the most of what would otherwise have been a disappointing day for a hike. We took out the Heritage in a light rain with minimal gear and hoped for the best. This was the start of the ride…. After a light drizzle, the rain stopped, and we started to enjoy the 80 miles through the desert. 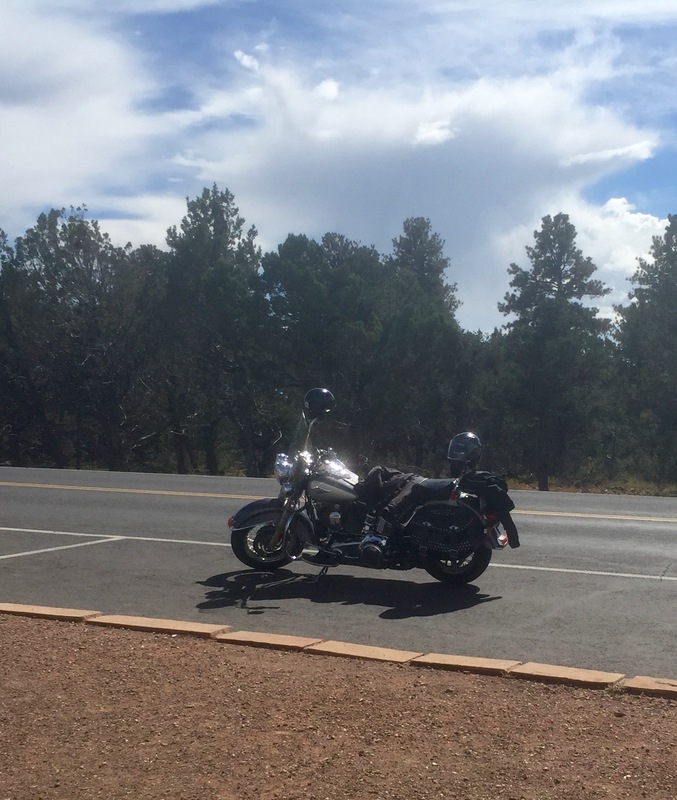 Once inside the Grand Canyon National Park, we parked the bike in the sun and tried to take in the view. We managed to grab a few good photos that cannot capture the vastness of the expanse. We were going to do one little hike and head back, then there was a downpour. We waited it out, hiked a little in the drizzle and then tried to head back. But there was a full on thunderstorm! We hoped to wait that out and for a little break in the rain before the sun set. Checking the radar, it wasn’t looking good, but we didn’t have much choice. 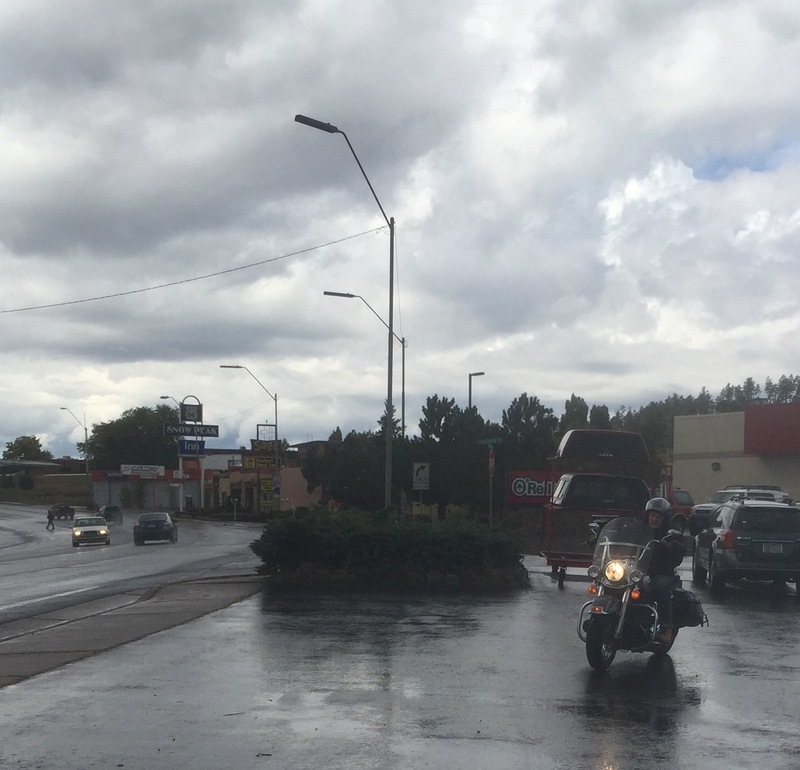 So we hopped on the bike and headed back toward Flagstaff with the rain pelting our faces as semis sped past us and lightning bolts loomed in the distance. Miraculously, we survived and hopped directly into the hot tub to recover from our hyperthermia. What an adventure! If not for the thrilling ride (entirely ill-advised), that portion of the trip would’ve been disappointing. But sometimes you have to take chances in life to see some rainbows. Since we didn’t have enough time to head up to Bryce Canyon or do Angel’s Landing in Zion, we’re planning another trip back. 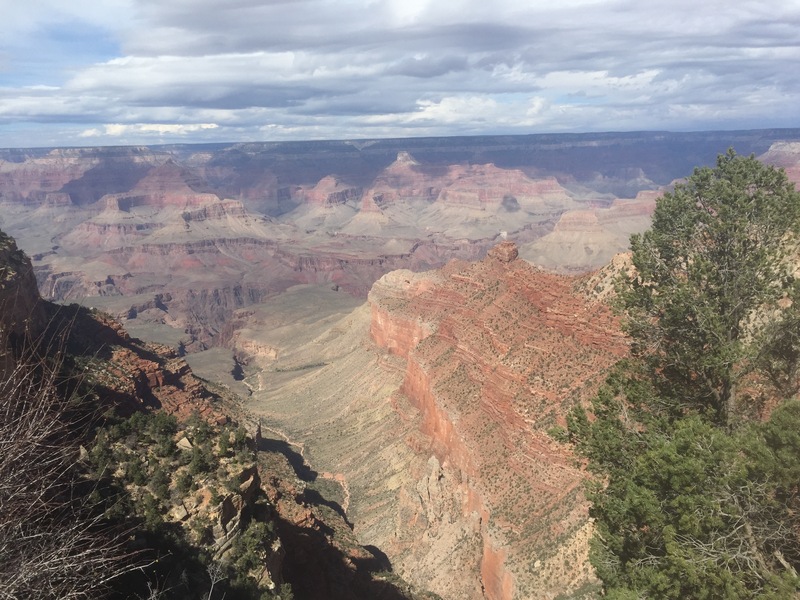 And hopefully next time we can hike from the North RIm to South Rim of the Grand Canyon. But we won’t be renting a motorcycle and driving through a desert storm again. Once in a lifetime is enough for that experience. 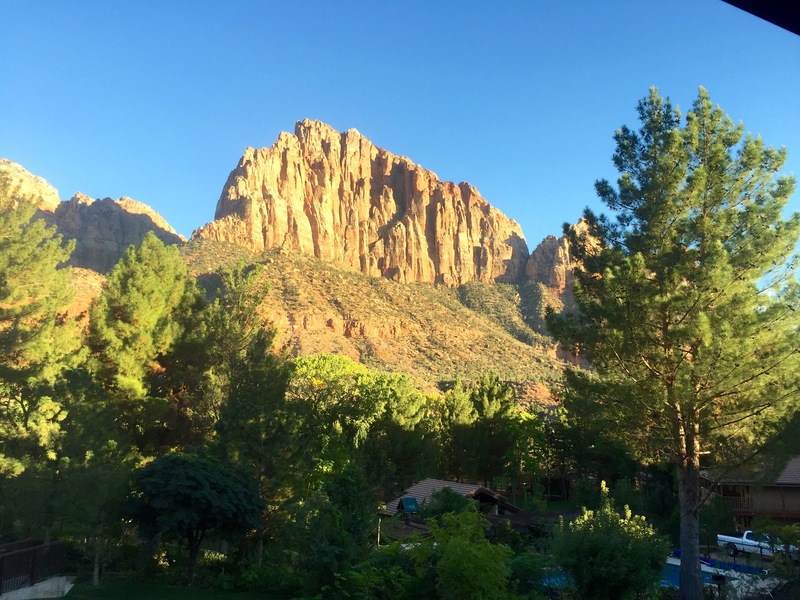 For Zion, Cliffrose Lodge is in walking distance to the park entrance (you will take shuttles once inside unless you want to hike a lot) but close enough to have ample food options in Springdale. Plus, they have a great pool and hot tub with stunning views. You’ll be glad to have that after a full day of hiking. For Flagstaff, we were frugal and picked the Days Hotel, which was shockingly nice. The rooms were a little loud, but you can’t beat the indoor pool, hot tub and overall value. For Zion, if you want cheap and tasty with a decent beer selection, Tex-Mex, try Bit & Spur. The beef enchiladas were big enough for two and with a side of chile verde (spicy pork stew), your stomach will thank you. Their house-made hot sauce is fabulous and for sale. Plus, you can actually drink here without feeling like a pariah in Mormon country. Prefer a fancier (pricier) meal and in the mood for steak? Go to the Switchback Grille but you might want to make a reservation since the service is a bit strange. Steaks here are best on the rarer side. One is enough if you are sharing, and they will split it for you along with the wedge salad without even asking. The scallop appetizer was shockingly good too. But this is not a place for much more than a cocktail or a glass of wine. Buy a bottle at the attached liquor store to enjoy in your room. For Flagstaff, we didn’t have much time and a number of restaurants close at 7 or 8pm. (I don’t understand it.) The restaurant by the Days Hotel, Northern Pines, wasn’t bad and certainly reasonably priced. In town, we had an amazing Korean burger and OK BBQ at the Lumberyard Brewing Company. Service was great and they had country music couples dancing on Friday night, with lots of drink specials. It’s a college kind of bar, so make sure you’re up for that. You should definitely go back to visit Bryce, my favorite by far compared to Grand Canyon and Zion. So beautiful! Now to find the time to go back! We’ve been three times already (2001, 2009, 2012). Bryce is the most beautiful when there is still some snow. The white snow, green pine trees and red rocks together are amazing. We were there in late April/early May when it was like that. Sunrise is pretty amazing as well. At least for you the flight is a lot shorter (and cheaper)!